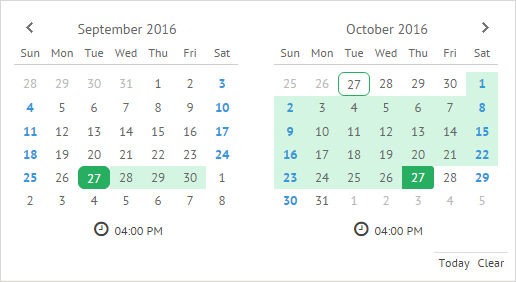 DateRange is a UI-related widget based on Calendar and inherited from Layout. 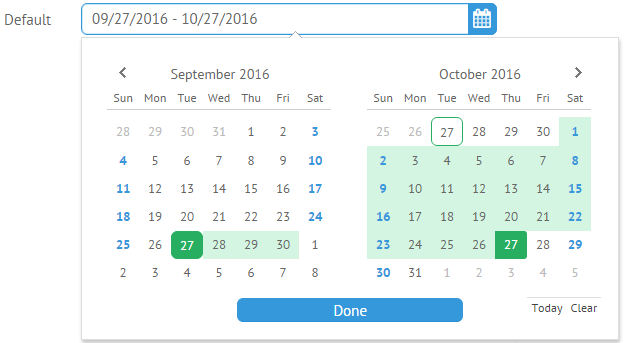 This interactive tool includes several calendars and allows selecting a date range. You can also pick the time by using the timepicker at the bottom of the widget. As a parameter, takes an object with the start and end properties that contain the start and end Date object of the range. The returned object is non-formatted and consists of the start and end properties for start and end dates correspondingly. You can set specific configuration for all calendars of the DateRange widget. You should use the calendar property for this purpose. DateRange can be shown by user request, e.g. when a user wants to pick a date range and time to fill the form. In this case, you can make use of the DateRangePicker control. Thus, you won't have to initialize DateRange, as it will appear when you click the DateRangePicker icon. You can add and customize the DateRange icons with the help of the icons parameter. The default icons are "Today" and "Clear". The Today icon allows selecting the current date. The Clear icon removes date selection. To hide the icons, you should set the icons property to false. return "<span class='webix_cal_icon_week webix_cal_icon'>Current week</span>"